How Can a Cactus Die? Darned if I know! My mom has the greenest thumb I know. Unfortunately, I can't say the same for myself. Despite the fact that several plants have withered away to brown nothingness under my care, my mom still likes giving me her creations every now and then. Her latest gift was this small pot of cacti that she placed in my bathroom. It was cute. A splash of green always livens the room up. And a cactus shouldn't be that hard to keep alive, right? After all you don't really have to water a cactus. Or do you? I don't really know. All I remember is Jerry asking me "How the heck can you kill a cactus?" Excuse me? I don't KILL plants. I may kill ants, but not plants! They just die by themselves! They're still mostly green but the roots are a sickly black/brown. Good thing mommy is coming over tomorrow...maybe she can resuscitate them? And in case you are wondering what a REALLY DEAD cactus looks like, here is one I saw on http://www.hardison.info/february_5,_2005.htm. My cacti do not look like that, do they? First of all, isn't putting a cactus in the bathroom kinda dangerous? I mean, ONE slip on the slippery floor and HOO-HA!!! Secondly, cacti like DRY weather. Ummmm...isn't a bathroom, like....damp? Wet? Always moist? Baka nababasa cya kya namamatay. Succulent kasi cya. Try mong ilabas. Livi - now THAT makes sense too. Come to think of it, I would do the same thing. I think the bathroom was a very wrong choice but what do I know, I manage to kill anything potted and most things outside as well. 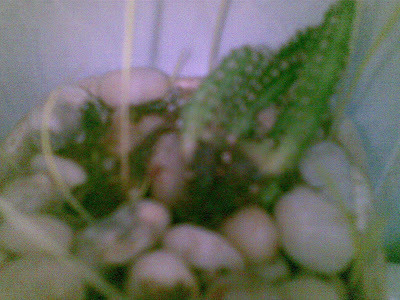 Sakin din nanghina cactus and like you sa banyo ko kasi nilagay. Anyway nilabas ko sya sa sun and happy na cya. I don't water it na rin. Mga once a week nlng and few drops lng. Binabalik ko sa sa bathroom but it stays out sa sun every other day. Hehe. Dami ko na din na kill na plants ni ma.